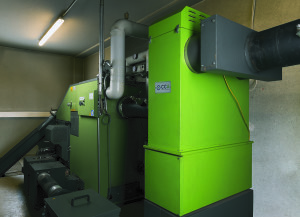 Wood combustion in small scale boilers is widely used for domestic heating. The combination of different parameters such as fuel quality, combustion conditions and boiler capacity can have a strong impact on the quality of exhaust gases, for example on the level of particle emissions (PM). Thanks to the progress achieved in combustion technologies, small scale boilers generally achieve low emissions with respect to mass concentration, however, sub-micron particles, can still contribute to raising PM levels in urban areas, especially during winter. These fine particles are associated to a series of respiratory diseases, and for this reason strict regulatory requirements for small scale combustion systems have been introduced recently in some European countries. For example, in Germany the First Federal Emission Protection Ordinance in force since 2015, sets a limit of 0,02g/Nm³ of particulate emissions for biomass combustion boilers. While this represents a challenge for manufacturers, some advanced technologies are increasingly becoming available, which can strongly reduce PM emissions from small scale biomass systems well below these limits. An effective way of reducing emissions is to install a cleaning equipment for the exhaust gas. While these systems are commonly applied in large scale plants, their use in small scale appliances is not so common yet. In this field the use of electrostatic precipitators (ESPs) can be an effective solution since it ensures high collection efficiency for various-sized particles, especially sub-micron ones, which are predominant in exhaust gases from the small scale wood combustion facilities. Cost effectiveness and easy maintenance. Inspired by the principles above, researchers at the Karlsruhe Institute of Technology in Germany have developed the CAROLA® electrostatic precipitator (Corona Aerosol Abscheider). This consists of a thermo-insulated housing in which an ionizer, a collector and an ash-box are installed. The ionizer consists of a grounded tube, in which a high voltage electrode is installed. The ionizer is equipped with an automatic system for periodical cleaning. Collector tubes with rotating brush-electrodes are also equipped with plates for cleaning. 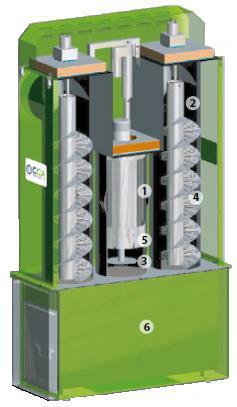 Finally, an ash-box is installed in the bottom and is used for collection of the fly ash. The particle loaded gas flows into the ionizer, when a high voltage is applied to the electrode, the particles receive an electric charge. The charged particles are then transported into the ash-box and further into the collector tubes, where the precipitation takes place. Finally, the output gas flows into the gas duct or chimney. 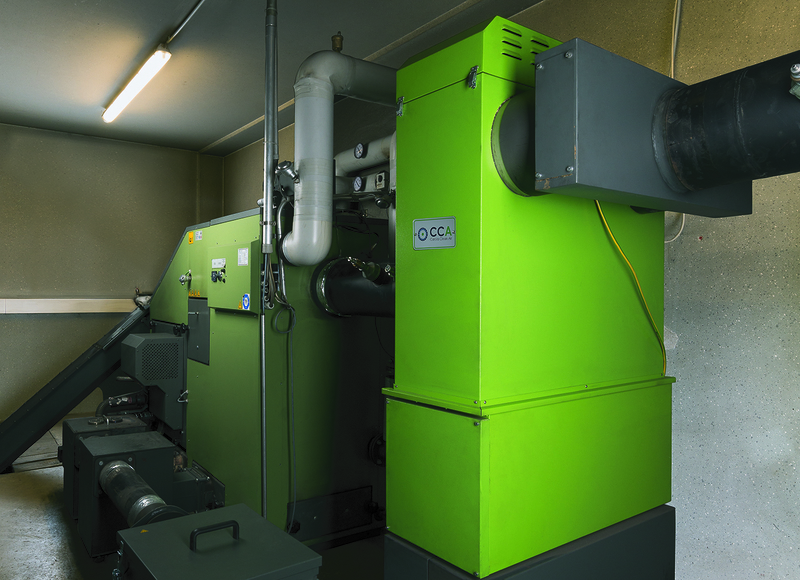 A major advantage of this system is that it can be designed as stand-alone or event integrated in existing biomass combustion systems. Currently, various CAROLA® electrostatic precipitators are undergoing long-term tests at various locations, the total operation time exceeds 30.000 h and the tests are showing very good results in term of long-term operational stability. The ESP ensures effective gas cleaning and reduction of fine particle emissions for various combustion conditions. At particle mass concentration upstream of the ESP up to 85 mg/Nm³, the collection efficiency is around 80%. This results in reduction of particle mass concentration in the clean gas below the level of 0,02 g/Nm³. At the same time, the power consumption of these system is quite low, around 0,05 kW/h for a mid-range model. This post is based on the paper “Development and demonstration of an electrostatical precipitator, which is optimally adapted to a biomass boiler”, written byA. Bologa, M, Ecker, H.-P. Reinheimer, H.-R. Paur, presented at the 24th European Biomass Conference and Exhibition.